Big open streets show you everything. They're great thirsty towels that ask nothing. They ask nothing from you but to look and absorb. They give you answers whereas the narrow alleys just ask questions. Alleyways, little alleys, twisted back streets, small gated enclosures kick start the imagination. For every piece they show you, they ask you to imagine all the things that might be there. Yes, alleyways tease your imagination into thinking back two hundred years, 400 hundred years and maybe even further to the ages of humanity that struggled up their heights or down their steps or looked in fear around their corners and in hope, at the slivers of sky they could see above. For imaginative tourists, the alley, the back street, the hidden garden is the lifeblood of travel. ​I like taking pictures of alleyways whenever I travel. It fascinates me. It is as if they keep secrets that the city wants you to discover only if you have the courage to dig into its entrails. Do Some Alleyways Scare You? ​I must admit that some alleys scare me. No matter how inviting they may be, I just can't make myself go in. But take pictures I do of these alleyways and leave the rest to my imagination as I look at my photos. Sometimes, though, you get a surprise. It is in these alleyways where often you find the kindest people and the most helpful and welcoming. So, take the risk sometimes and open yourself to a new adventure. With the camera in hand, open, broad streets give back nothing. But looking to the left or the right as you walk, the lanes, alleyways and twisted back streets give pictures that tease your imagination well into the past and the shadows of the future. You see real people going about their lives, some in the same way generations before them have done so. Be respectful ad don't just take pictures without asking. Become a part of what you are seeing by interacting with the locals. They won't eat you. We've traveled around the world and seldom look at the classic photographs of great arches, the iconic buildings or the historic fountains and statues. It is always the picture of the shaded side street that makes us stop and think and dream of 50 generations of humanity that shared the evolving space. ​Alleyways often tell of the city's chaos. 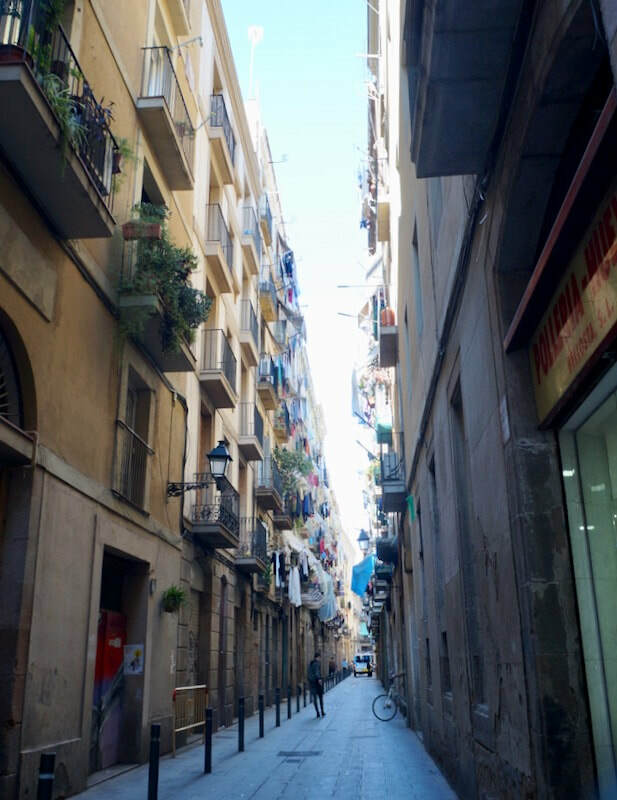 Laundry hanging from windows; garbage cans suggled close to each building, sometimes smelling, waiting for pick up; characters in the shade, obscure or doing the work they have to do. Working closely with immigrants, the author defines the experience of being displaced in a new environment, how alleyways where often displaced people end up are also the paths to faith. ​Once in a while, take on an alleyway. You will find not just the gritty and mundane but the beauty as well. Following the wafting smell of bread or coffee, we have discovered some of the best neighbourhood food in the city. We have tripped over stores that supply the best produce to the locals of the area, some of the best art and architectural nuances. So far, we haven't encountered trouble. We have only the best of experiences, enough to make me venture more often into these narrow trails. I always leave delighted, full of new learning and sometimes, with new friends. ​Travellers are met with conflicting feelings when they see narrow lanes in unfamiliar cities. But a few, feel these places drawing them in. Adventure calls when a dark close presents itself. Often, for Grumpy and I, this is a tug of war. For me, though I want to take photos of these alleyways, they often present danger. For my husband, they invite exploration, new knowledge, new experience. If its really scrungy, forget it. There's lots more. Look for laundry hanging outside. That means families live there. Look for kids playing in the alley. Same thing. Make sure there are two of you. Don't look scared. Have a smile in your lips and let people in the alley see it. Don't stuff cameras in people's faces. They may explode. Look for signs of small shops. When you find one, go in and buy some mints. Have a question ready of something credible you're looking for. Ask directions. It gives you a purpose. Lost tourist are non-threatening to the locals. ​Gated Alleys - Support this Move? Many cities now have gated alleyways to prevent people from throwing garbage and protecting the residents from crimes often committed in some of these alleyways. Residents want their alleyways safe once again. Want more on how to make your travel more satisfying? What about you? Share with us what you think about alleyways. When you travel, do you like exploring alleyways when you travel?